A tourist believed to be from the US has been killed in a lion attack at a game park in South Africa, a park official has told the BBC. The lioness jumped through the open window of the couple's car and started mauling the woman, assistant park manager Scott Simpson said. 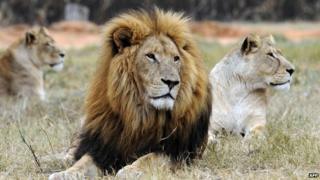 The popular Lion Park is 30km (19 miles) north of Johannesburg. The park's rules forbid visitors from driving through the lion enclosure with their windows down, reports the BBC's Milton Nkosi from Johannesburg. Media captionThe lioness jumped through the open window of a car as Catharina Moh reports. Park rangers chased the lioness away after the attack, and it is not clear whether the animal will now have to be put down, our correspondent adds. Local media are reporting that the woman's death marks the third incident in the past four months at the park. This afternoon's attack in the Lion Park came as a shock not only to the tourists and staff there but to me too. I am a frequent visitor to the park. It's a great place to take the family and I've taken my own kids there for as long as I can remember. We also take international visitors who want to have a feel of the African wildlife experience without having to drive for hundreds of kilometres into the bush. The park's location near to Johannesburg makes it an easy destination for many tourists who are in town for a short time attending a conference or business meetings. The lions are kept in large fenced-off enclosures which visitors can drive through themselves. The official South African tourism website describes the park as a "hybrid between a zoo and a game reserve", while the Lion Park's website says "super close-up animal views" are guaranteed. Cheetahs, spotted hyenas and giraffe are also in the park. The Lion Park is one of the region's most popular destinations, attracting tourists from around the world. Previous high-profile visitors have reportedly included Colombian singer Shakira, Hollywood actress Natalie Portman, as well as the entire German football team before the 2010 World Cup in South Africa.